I had a training meeting this morning, so after spending an hour after work yesterday preparing for a substitute to take my classes half the day, I enjoyed an extra 45 minutes this morning at home before I had to head out the door. The training was great, but the nice part was the information was relevant to what I am doing now, and I had some of my brilliant colleagues to collaborate with during the activities and discussions.The district did have a continental breakfast there, but after my morning shake I skipped the bagels and donuts, and ate a banana and had a small glass of orange juice. Two fruits down for me!!!! I was very, very good. I returned to school in time for lunch (leftover pasta and yogurt) and a plan session, taught my afternoon classes and headed home in record time. A very good work day. My body training started in the late afternoon again today. I was a bit of a slug this morning, too, since I had stayed up so late last night. After work and dinner I did my NEWO with Jonathan Roche's DVD and called it a day for my workout. There is still a foot of snow that has yet to melt in our yard. Raymond's poor trampoline is bulging from the weight. 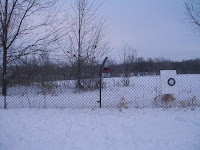 I hope it bounces back after the thaw. The boys and I have been enjoying bird watching. The bird feeder in our yard attracts all kinds of birds and over the past weeks the birds have been very hungry. My favorite visitors are the cardinals. We had at least four pairs of the red birds that show up this afternoon at the same time. I think the birds are getting the word out, because every day there are more birds than the day before. The melting starting yesterday with temperatures just above freezing. Today we were not that fortunate. 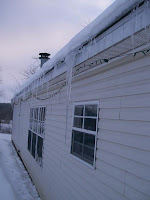 Icicles hanging from the house over five feet long. The day started out foggy and dreary. The day ended dark and dreary. I am so hoping for promised (forecasted) sunshine tomorrow. And a warmer day too.